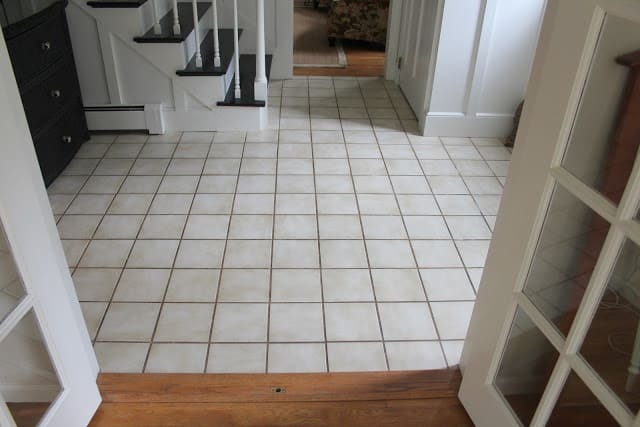 Did you know you could paint tile and grout? Yes, it’s true. 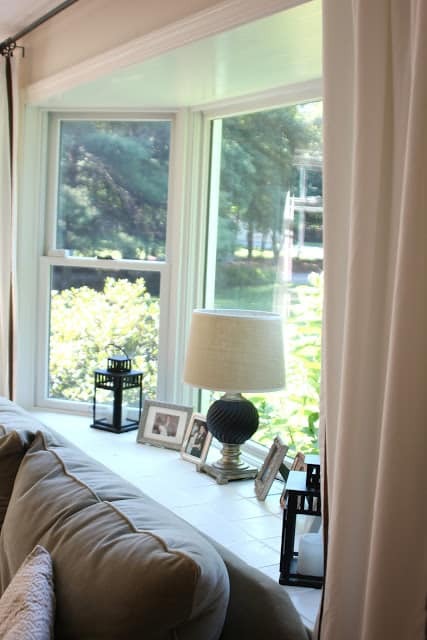 When we first moved to our 80s-era house, the living room and adjoining dining room were sporting a whole lot of dusty rose and orange oak…..
….including three rosy-tiled bay windows between the two rooms. 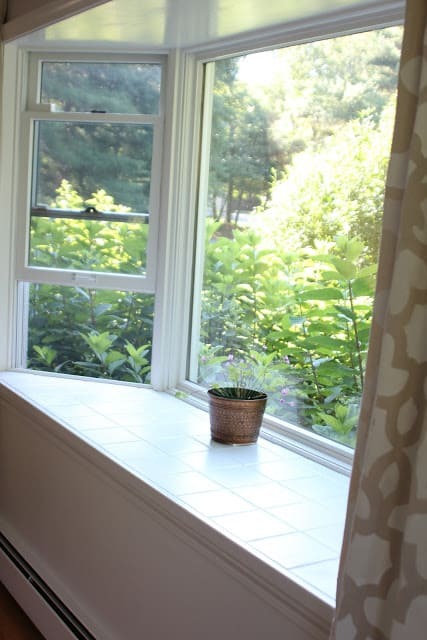 After painting the walls and trim, those rosy window sills were begging for a color change! So what’s a girl to do? Why of course, paint those suckers right up. I’ll admit I was a bit apprehensive about how this was going to go. and that tile blends right in. I am so glad I took the plunge and painted them!!! What a difference it makes to our house! And here it is this morning….still a work in progress but coming along. Can you imagine if I had painted the whole room and left the window sills dusty rose??? 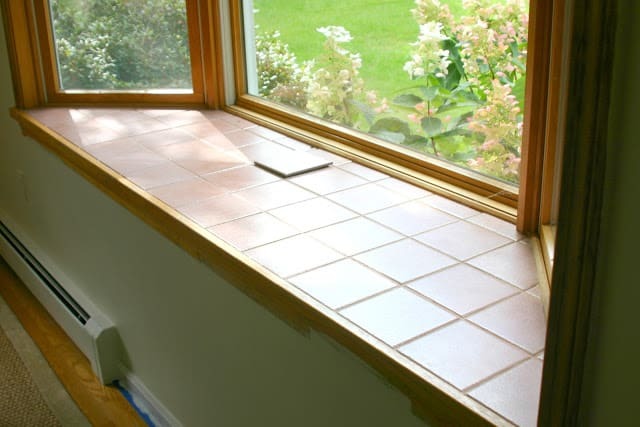 The painted tile sills are still going strong! I have given them a fresh coat of paint from time to time but after 7 years they are still in great condition. 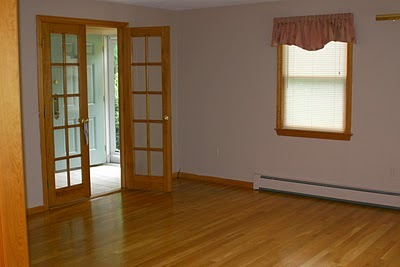 Come see what this room likes like now! 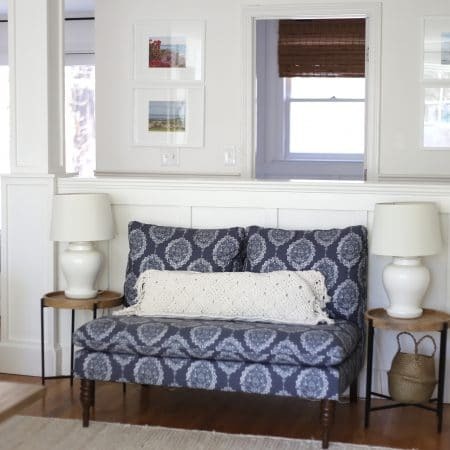 In the living room, the tile is mostly hidden behind the couch, but the coat of white paint reflects the light and brightens up the room. 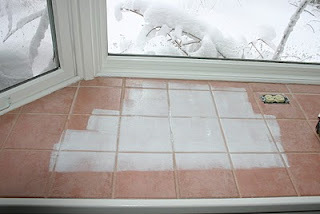 The paint on the living room bay window sill is still in perfect condition, and makes the tile disappear into the background. I am so glad I took the plunge and painted it years ago! 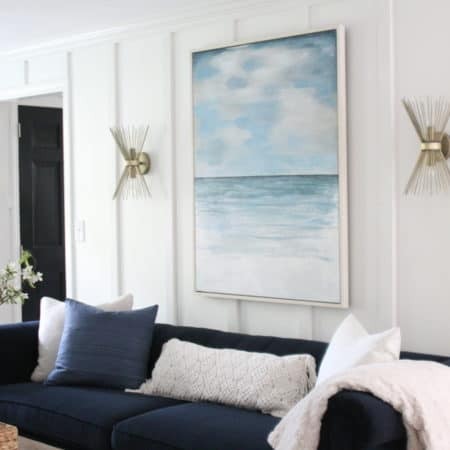 Come see how paint transformed our living room! I’ve even been desperate enough to paint the floors in this outdated abode. In our foyer we have this sweet 80’s tile on the floor. Our plan is to replace this flooring with hardwood when we do our kitchen over, since that floor will be replaced with hardwood too. Mark & I despise this floor that never looks clean, has crumbling grout and looks SO dated. I left it like that for months on end (passive aggressive – my angst towards the tile caused me to ignore it completely) and I realized that the painted grout held up surprisingly well to traffic and muddy paw prints. One day when the house was quiet I grabbed water-based white primer from the garage and mixed in some brown to try to get close to that beautiful tile color :). I painted it on the grout lines with a small artist’s brush, wiping the excess off the tile with a paper towel as I went. The grout is still a bit too white, but I think it’s an improvement, don’t you? 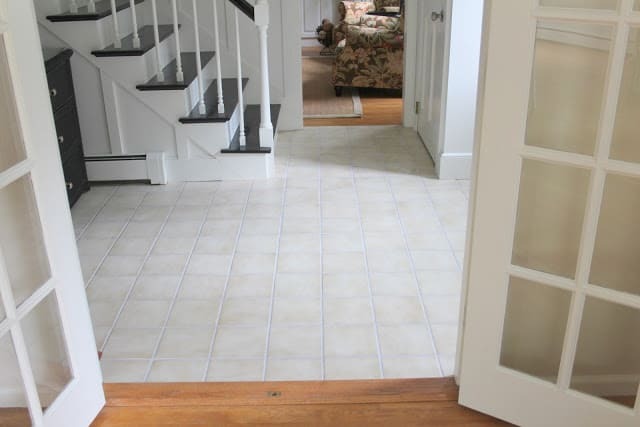 With the grout lightened, the eye isn’t as drawn to the floor when you walk into the room. I’m not going to kid you, it’s still hideous, and Mark & I are both dying to take a sledgehammer to this tile and remove it, but all in good time. Months have gone by since I painted the floor grout and I am happy to report that it takes a good scrubbing and has held up well in a high-traffic area. 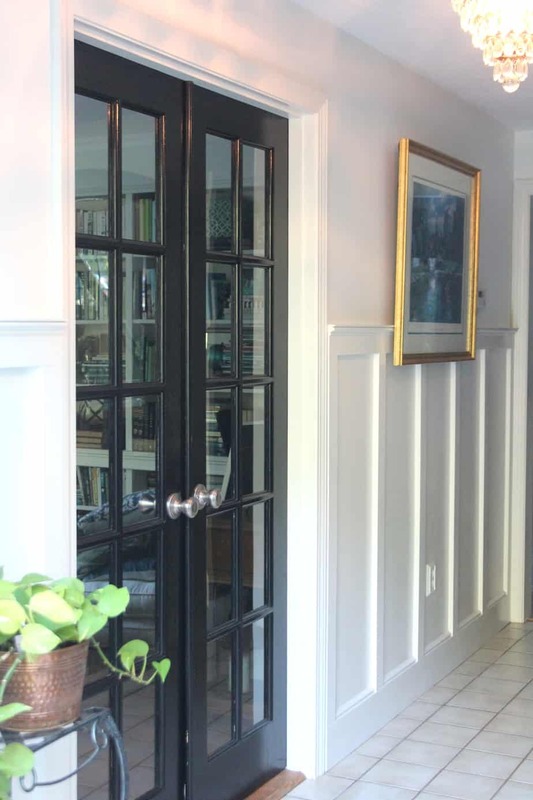 the painted grout lasted for about 2 years, in a high traffic area with 3 kids and a Saint Bernard, with many floor washings before needing to be redone! The next time I painted the grout I went with a color that was a little closer to the tile, which is unfortunately still with us, but the rest of the space has changed a lot! 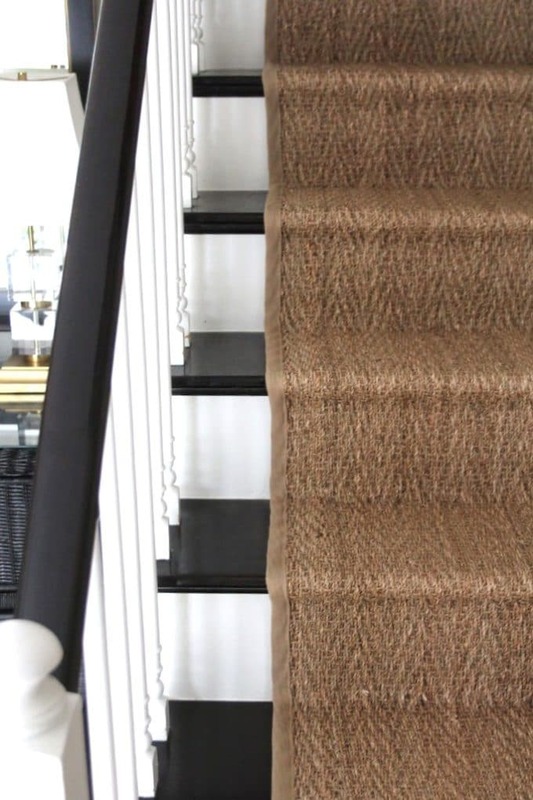 The stairs were the most dramatic makeover – check them out here! If you have tile you dislike but can’t afford to rip it out and start over, consider painting it. Need some more encouragement? Check out Andrea’s painted tile in her daughter’s bathroom! 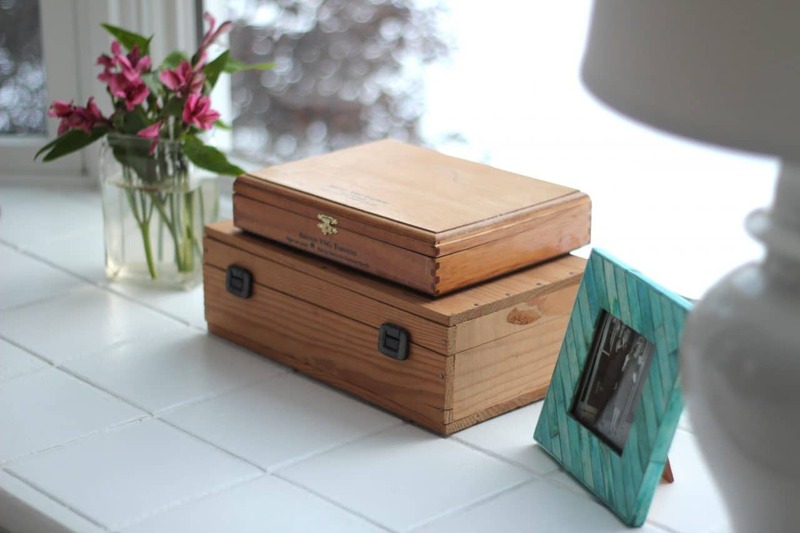 For tons of doable DIYs, check out my PROJECT GALLERY! Thank you for visiting Shine Your Light! It looks so great!! I love it. Your house has so many awesome, different, architectural things to it. 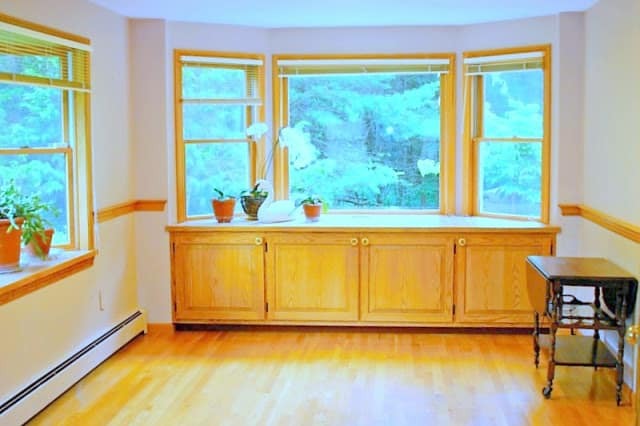 Man, I love the dining room with the window seat and built in hutch! Fab. 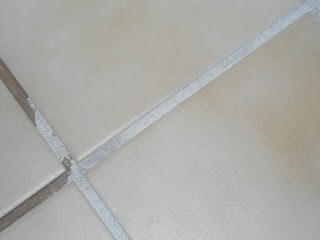 I too have been cursed with some early 90's off white tile in my kitchen – which I hate!!! but have to live with for now. Much more pressing projects to complete first, and it's in good shape. My husband's cousin and his wife had all of their tile flooring professionally painted and it's held up beautifully for over a decade now! I love this post! I've never painted tile before but have definitely had the urge to do so! And by the way, your dining room is gorgeous. Seriously! the painted tile looks so amazing and does blend beautifully now- the room feels so open and airy. as for the countertops, kathleen at between blue & yellow used that giana (or whatever it is called!) countertop paint in her kitchen and i saw it in person- it looks awesome! Oh, this looks awesome! Such an improvement. I've never painted tile before, but glad to know it's possible!! I recently painted the tile in our bathroom shower with a special tile and tub paint and it looks AMAZING! I can't believe I didn't use this trick sooner! Love the tiles – looks great! Oh. my. Gosh! That floor looks 1,000 times better with that one little change! Looks like it's been that way all along. And, I haven't seen your dining room in a while-it's gorgeous! LOVE the curtains, can you share a source for those? My friend painted over her shiny white bathroom tile that was the backsplash in her kitchen and it held up really well for the 3 years that she lived there. Such a good option for a quick fix! The power of the color white! Love how much better your touch ups have done to your home! Ummm…your dining room is beautiful! I love how it turned out. And that lantern is perfect! Good job with all the painting! You're cracking me up here with your bologna countertops. But the grout change really makes a big difference! I think we had that same tile in the foyer of our first home, so I totally know where you're coming from. 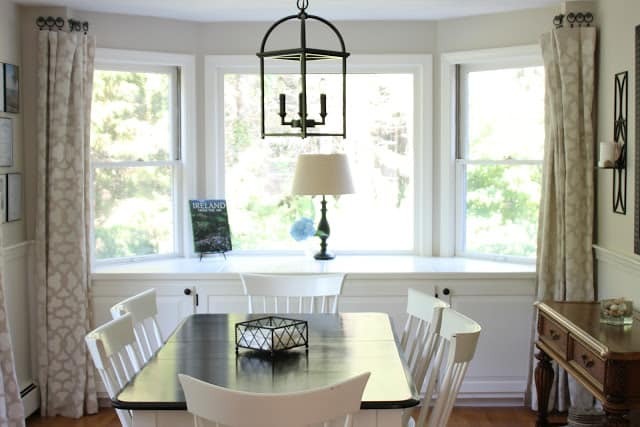 The dining room looks fantastic – so updated and modern, yet welcoming. Hey, whatever works and gets you through! Your dining room is looking beautiful, Lisa. I LOVE what this did to the tiled area! It opens the space right up! i LOVE that you painted your tile and grout! I also LOVE your style. Gorgeous dining room! Brilliant idea to paint the tile! 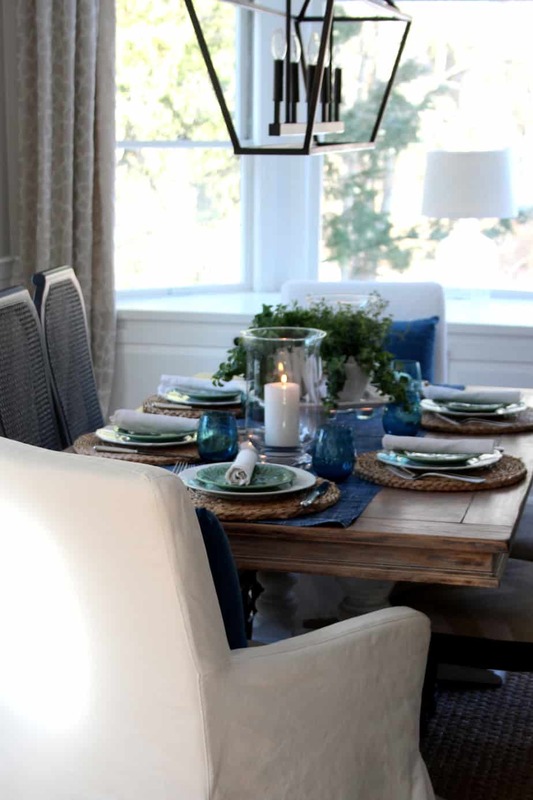 Your dining room is perfect Lisa! It has been fun to watch the transformation. 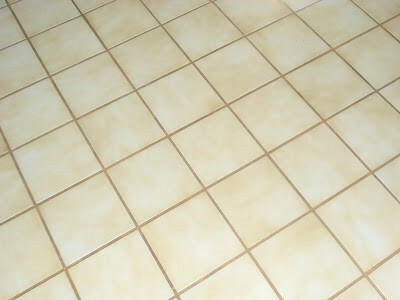 We have similar floor tile in our sunroom and the grout always looks nasty. I share your sledge hammer fantasies. We painted our "bologna" bathroom tiles 6 years ago! still golding strong! 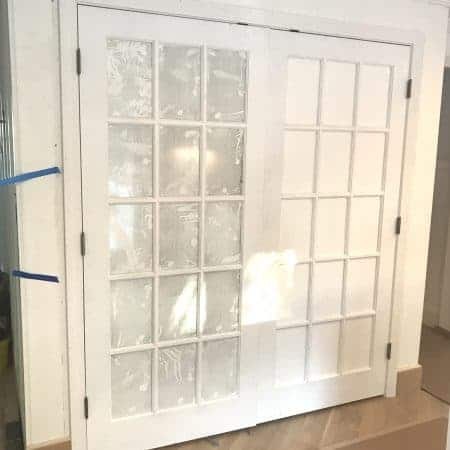 we did 123 primer and then latex paint! kudos to you! Also you can paint counter tops! they have counter top paint kit for a very reasonable price (less than $50?). Do it! following your blog. 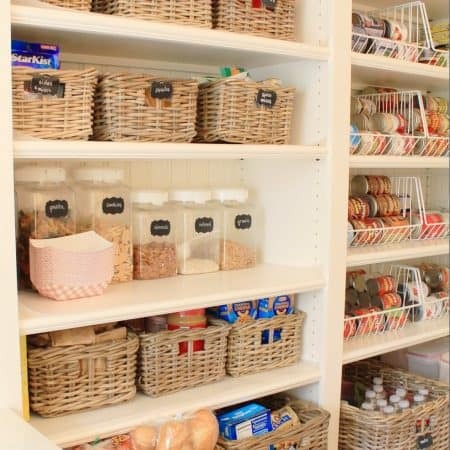 hop on over my blog to find frugal projects on a budget!! hope you'll join me in the fun! I love the windowsills! We just redid the ceiling in one if our rooms, and while scraping off the popcorn, we found that the tile behind our wood stove had been painted! I started peeling it off, but hubs didn't like the color underneath the paint. So now I get to repaint that tile. Also my 5year old was sitting next to me and wants you to know she really loves your house, and would like you to move so we can buy it and move in, lol. You crack me up with the bologna! I can't believe what a difference painting the tile and grout makes! Lisa, your tile turned out fabulous! First time to your blog… I'll be back! Awesome tips, and I cannot wait to try the paint on my ugly grout! The tiles sure do look new with the paint, you would never know they used to be pink. I laughed when I saw your comparison of your countertops to bologna, in my old house, the countertops were peach color, similar to yours, but the countertop ran up the wall to the cabinets, so technically, the backsplash was just as peachy. Just stopped by from At the Picket Fence and I love your dining room! I was lured in by the Ireland book too! That is one of our most favorite places in all the world! Your home is lovely with all your soft colors. Painting the tiles was genius! Have you looked at giani granite for the countertops. That might be an option! Can't wait to look around some more! Have a great weekend! Hi Lisa! Saw you over at At the Picket Fence and had to come visit! That painted tile is AMAZING! 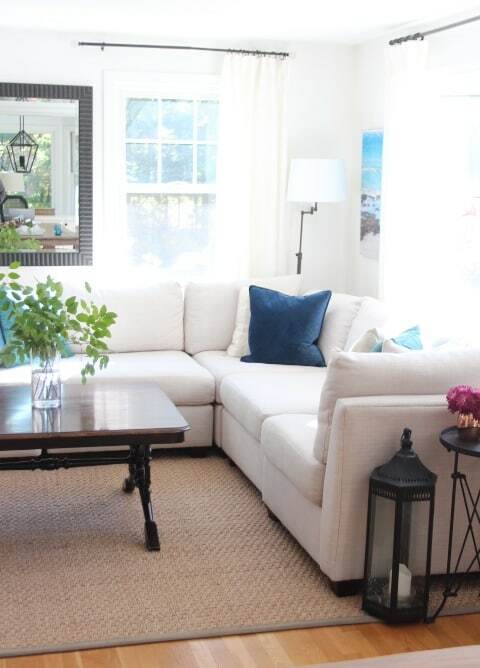 And I love your dining room window treatment– great solution to tricky angles and corners! Oh my goodness Lisa this is amazing!!! I always wondered if you could do that, so good to know! Love love love! Yes, there are some tiles which we can use for painting purpose and can add some colors according to your choice. What a fresh and pretty update! I had no idea you could paint tile and grout. This opens up a world of new options! You can paint your counter tops. I did it using acrylic paints from Hobby Lobby. All you need to do is paint the counter tops with a base color (any wall paint will do). Then using a sponge lightly dab your colors. I used multiple browns giving it a granite look. Once you are done (it's really hard to mess it up, if you don't like it just keep dabbing). To seal it put 4 or 5 coats of polycrylic on it. Mine held up for 4 years, (we moved houses). 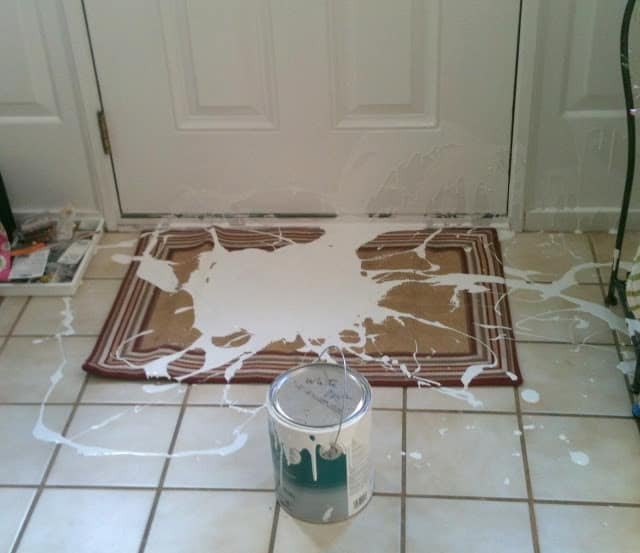 Your floors looks great! In more than one apartment, and in the laundry room of the home we now own, I've covered countertops with con-tac paper. I used green marble in my laundry room and it looks great. Unless you know, you really can't tell.